1UP.com's Jeremy Parish had been looking for a new DS Lite to replace a well-loved (and steadily deteriorating) Zelda-themed unit. He turned to eBay to fulfil his need for the recently discontinued piece of tech, and found a model that appeared to fit the bill. But from the moment he unpacked the system from its box, Parish had an unsettling suspicion that something wasn't right - a series of blemishes and discrepancies would ultimately convince him that the unit he had purchased was a counterfeit. The twist? Despite being a bootleg, the console operated extraordinarily well. 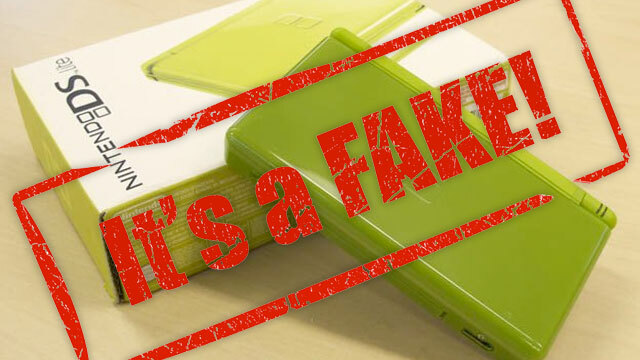 You may have run into a bootleg DS or Game Boy Advance game in your travels, but a handheld? Parish goes into significant detail describing how he reached the conclusion that the DS was a fake. "The texture and construction of the box didn't feel like typical Nintendo material - since when have they used corrugated cardboard boxes for game systems?" But the box was only the beginning. "The surface of the system has a few small pockmarks... The inner bezel of both screens is discolored around the edges with what appears to be substandard glue... [there is]misaligned silkscreening on the back." The list goes on, and he includes photographs of each suspicious defect. But the real surprise was not so much that the system looked authentic, but that it operated more-or-less perfectly. No, what astounds me is that, cosmetic flaws aside, this system is practically perfect. The plastics are indistinguishable from the ones Nintendo uses; the heft and feel are the same. And most of all, the system works. It boots up to the familiar BIOS, and both GBA and DS games (even famously pirate-resistant carts like Dragon Quest IX and The World Ends With You) boot and play without a hiccup. There are no dead pixels on either screen (something even Nintendo can't pull off perfectly, as the perpetual orange dot on my DSi XL's top screen will attest). The clone-makers even managed to duplicate the DS Lite's persistent inconsistency in the colour temperature of the screens: The upper screen is cooler than the bottom screen. Parish drew my attention to design and construction subtleties that had never crossed my mind - and perhaps hadn't crossed his, until he became the unintentional recipient of a bootlegged model. The silver lining to his otherwise unfortunate ordeal? Or perhaps the machine is a real DS that failed QA and was then refurbished by someone working at the factory. I don't care if it's a fake, I WANT THAT COLOUR! it is a refurbished unit. so when i received it in the mail, everything looked different and the quality was off for an official nintendo product. i reported it to ebay and i demanded the sellers pay for return shipping which they promised once i had sent it back with a copy of the receipt of the return cost. they lied, and i only got back what i originally paid for. so i've tried to avoid ebay and china since then. I've been looking to get a DS lite to replace my phat DS. The battery on those things lasts forever right? it's a real ds in a new shell. it's a refurbished ds sold as new. nothing to get all excited about it.